Tracealyzer gives an unprecedented insight into the run-time world of ThreadX systems. Solve problems in a fraction of the time otherwise needed, develop more robust designs and find new ways to improve your software’s performance. 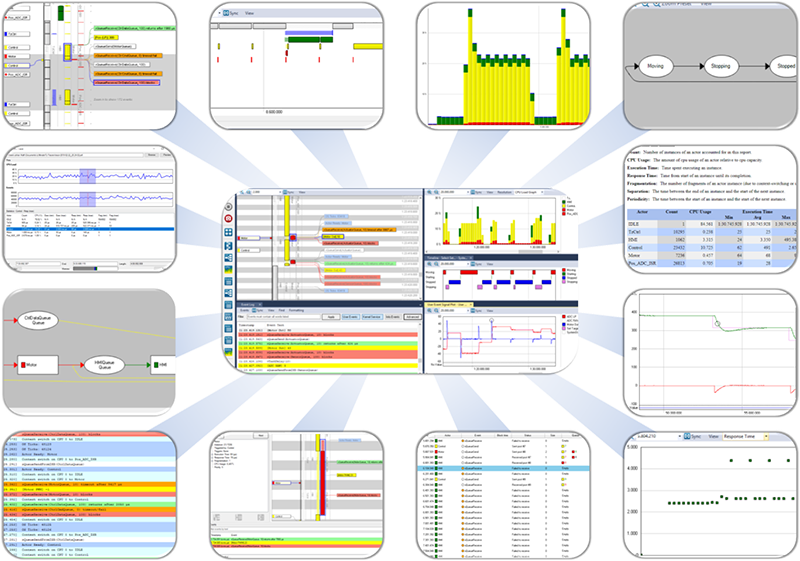 Tracealyzer for ThreadX visualizes the runtime behavior of your ThreadX system with over 25 graphical views that complements the debugger’s detailed, low-level perspective with the big picture. Tracealyzer gives unprecedented insight that speeds up debugging and provide better means for validation and performance optimization. Issues that otherwise may require many hours, days or even weeks to solve, can with Tracealyzer be understood quickly. See what is really going on in your system and avoid many hours of frustrating trial-and-error troubleshooting! “We are extremely excited and pleased about the Tracealyzer port to our Industrial Grade ThreadX RTOS. The combined best-in-class visualization assets of Percepio’s Tracealyzer and our industry leading ThreadX RTOS will greatly help embedded developers confidently get their IoT products to market quicker”. The visualization is based on traces from a lightweight trace library included in the ThreadX RTOS kernel, so you don’t need a high-end trace debugger. Tracealyzer for ThreadX displays kernel events like context-switches and ISRs, as well as middleware events from the NetX, FileX and UsbX stacks. You can also log your own custom events, to visualize any event or data in your firmware. Tracealyzer for ThreadX explicitly supports Renesas Synergy and other ports of ThreadX. The main trace view shows you all recorded events visualized on a vertical time-line, including task execution timing, interrupts, system calls and custom user events. The task and interrupt trace are shown as colored rectangles. Events are shown as floating text labels. Zooming is very easy using a click-and-drag selection, which also works as a measurement tool. Tasks and events can be clicked and highlighted for additional information, including timing and event dependencies. The lower right corner contains a powerful filter, and the Finder dialog provides even more powerful filters. When zooming out, this view naturally transforms into an overview where patterns can be studied. This view presents a horizontal time-line showing the total CPU usage, and also CPU usage per task/interrupt. The CPU Load Graph allows for navigating the main trace view, since a double click in the CPU Load Graph focuses the main trace view on the clicked interval. Zooming is allowed in this view as well, independently of other views, and filters are available for focusing on individual tasks or interrupts. This is an example of several Actor Instance Graphs, each showing the distributions of a specific timing property for an actor, i.e., a task or interrupt routine. This includes execution time, response time, fragmentation, and several others. Each data point represents one specific execution of a task or interrupt handler. This graph, Response Time, shows the variation in response times for two selected tasks. Tasks instances with high response times may reveal resource conflicts, e.g., where several tasks or interrupts compete for CPU time in a busy interval. This view makes it easier to spot such locations that may indicate problems or possibilities for optimization. All views with horizontal orientation can be combined in a single parent window, with synchronized scrolling. This allows for spotting patterns that otherwise would be hard to see using individual views, e.g., how the response time depends on other events, and this also allows for greater customization of the user interface. Many system calls allow for communication or synchronization between tasks. Tracealyzer understand these dependencies and the Communication Flow graph is a summary of all such dependencies found in the trace, in the form of a directed graph. This is a high-level view of the communication dependencies between tasks and interrupts, including the kernel objects used such as semaphores and message queues. Like in all views, double-clicking on a node opens a related view focused on the particular object. Double-clicking on a kernel object (e.g., a semaphore) opens the Object History view (shown below), a list of all events on the specific kernel object. If double-clicking on a task or interrupt, the Actor History view is opened showing all executions of the actor. This view shows all events on a particular kernel object, such as a message queue, semaphore or mutex. The events are presented as a list, and double-clicking on a list item shows the corresponding system call in the main trace view. For message queues and similar objects with send/receive operations, it is possible to follow a specific message from send to receive, or vice versa, and also to inspect the messages (by sequence number) in the queue at any given time. User-defined events, or User Events, allows you to log any event or data in your embedded application. This gives the flexibility of classic debug “printf” calls, but are much faster as all string formatting is done offline, in the viewer. Since you get the events on the same time-line as the kernel trace, it is easy to correlate the application event with the other views. When logging “User Events”, data arguments can also be included and plotted to visualize the data over time. By clicking on any data point in the plot, the corresponding User Event is highlighted in the main trace view. The plotting is highly useful for analysis of control algorithms, as it allows you to correlate the plotted data with the other time-line views to find the cause of any anomalies in the plot. Note that you can define a trace filter (using tx_trace_event_filter) to focus the trace on a subset of these event types. You can also add your own custom “User Events” by calling tx_trace_user_event_insert, described in the User Manual. Information on licensing and pricing is found on the Licensing page and local distributors are listed on the Partners page.